If his eyes were a key component then, they remain so now, undoubtedly, because they are usually the only thing instantly recognizable. Here is a man who has so thoroughly disappeared into his roles, so relentlessly transformed himself for the sake of ambitious – and sometimes unglamorous – portrayals, that it’s easy to lose track of his long and involved career trajectory. Who would have thought that Dracula was but a seed in the garden of his repertoire, which would also include Sid Vicious (“Sid & Nancy”), Lee Harvey Oswald (“JFK”), Beethoven (“Immortal Beloved”), a Russian terrorist (“Air Force One”), a disfigured victim of a serial killer (“Hannibal”), Sirius Black (the “Harry Potter” films) and Commissioner Jim Gordon (the “Dark Knight” trilogy)? It comes as no surprise to see him once again going against convention in “Darkest Hour,” where he undertakes the daunting task of convincing the audience that Winston Churchill is, indeed, standing in front of them, waging an intellectual war with members of the British parliament while the German army closes in on the opposing shores. The transformation follows in the tradition of his impeccable embodiments, and that’s almost unfortunate – because he is, alas, not selling the idea in a movie that warrants the effort of his skill. “Darkest Hour” is a droll, listless experience of a movie, an exercise that functions only because it is made in the service of its actor, who is more than up to the challenge of conveying a seamless portrayal. But if we are to remove him entirely from the equation, what is there? Would the movie even need to exist? The fallback of a great many important character studies – even the ones that seem destined for very specific actors – is the strength of a screenplay that prompts a sense of value in the details. Personalities of the past come alive again because of a united front, of actors who perfectly replicate a mannerism while a story builds a catalog of deliberations. 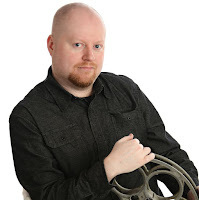 But no one else involved here does their part in matching Oldman’s austere conviction, and his dominance is slackened by a narrative that doesn’t know how to proceed, supporting characters that are directionless, and a camera that submits to the will of its players when it should be guiding them towards a clear goal. That goal is well-known, I suspect, only to a fragment of the audience. Title cards attempt to establish a general rule of details: at the dawn of Britain’s involvement with the Nazi offense, parliament is thrust into uncertainty as its Prime Minister, Neville Chamberlain, appears to be too pacified to answer the threat of war. As it looms ever-so-near and British troops begin to sense danger afoot on the shores of French soil, King George VI appoints a conservative to the key position: Winston Churchill, a quirky and gruff sort who is sometimes hard to take seriously. But his platform is a rigorous machine of standards that others look at with vexation, perhaps because it adopts a severity of tone they can’t fathom; they have no taste for the conflict in front of them, and Churchill wears his defiance as a badge of superiority. It is he and he alone who forecasted Hitler’s rise to power, and only he who can answer it with England’s best interests in mind. That Oldman plays all this sincerely and with incredible intricacy – his physical posture is almost exact to that of the man he impersonates – is admirable. Never does he undertake this demand as if he is playing in an inferior game. But the movie surrounding him is held back by an awe of personality that it cannot rise above, as if the script and direction are formulated from minds too paralyzed by the portrayal to do anything significant with it. 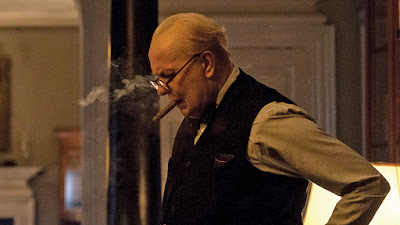 That often means most of the film is filled with relentless shots of Churchill walking back and forth between war rooms, bedrooms, studies and palace halls to always appear busy, although the dialogue exchanges are usually pitched at a depth of soundbites (almost nothing of consequence is ever said between he and his wife, for instance). Even when the dramatic tone escalates, and the movie must demand Churchill seek unlikely advice from the civilians aboard a tunnel train, it doesn’t seem at all that realistic. The movie contrives situations to the benefit of anchoring his worldview. I am not exactly well-versed in my knowledge of the man’s decisions or his popularity (for all I know, those proclamations of “never give up” aboard the train may have actually happened), but some small part of me hopes he was decisive enough without requiring the input of a desperate populace, especially in the 11th hour. There is also the issue of the movie’s ending. It shatters the hope of a payoff. We are led through the rough road of the lead’s early days, arrive at a culmination of his values and life-altering decisions on the floor of the parliament, and then… the movie doesn’t even give him a moment to bask in triumph? How fair is that? The real Winston Churchill was, unfortunately, relegated to afterthought after he lost an election following the end of the war, but those key decisions involving Dunkirk – including the desperate strategy of asking civilian cruise liners to contribute to the rescue effort – were but a fraction of his relevance as the country’s wartime leader. To have an entire film center on that brief snapshot is to obligate the need for a successful sigh, or at least an acknowledgment of the road ahead. But no, Wright’s picture instead opts to drown out the celebratory moment by his primary figure disappearing into a shadow before the closing credits roll, disrupting the momentum he has built to that moment. But by then, of course, maybe it’s a mixed blessing. 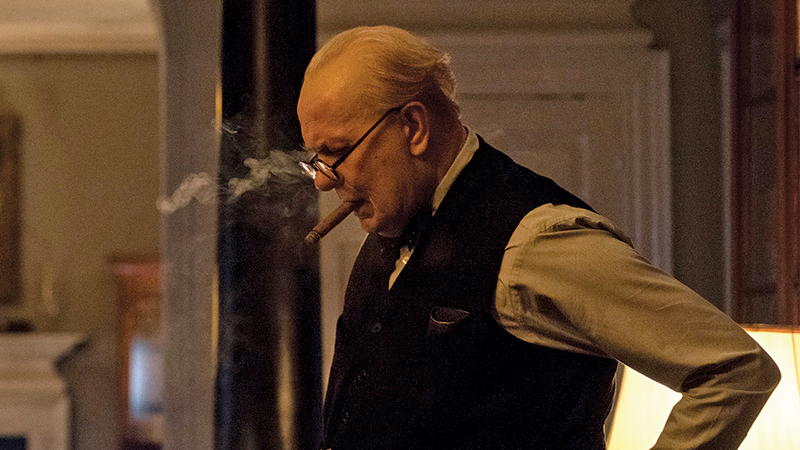 “Darkest Hour” barely holds our attention as a vehicle for historical and political intrigue, and if this is an accurate depiction of those critical few days, perhaps Churchill was just as bored by the end as we are.